“While working to conserve the entire Connecticut River watershed, Cynthia Boettner has demonstrated indefatigable effort and leadership in invasive plant control throughout New England.” reports the New England Wild Flower Society, (NEWFS) who honored Cynthia ’86 with their 2012 Conservation Award. 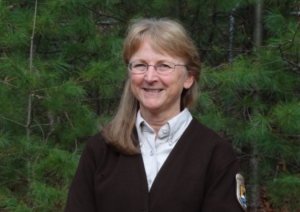 Cynthia has worked at the Silvio O. Conte National Fish and Wildlife Refuge in Sunderland, MA, since 1999 where she coordinates the Invasive Plant Control Initiative. Working with volunteers and the staff of the Connecticut River Watershed Invasive Plant Control Initiative, she helps lead the effort to keep water chestnut in check in the watershed. With partners from University of Connecticut and NEWFS, Cynthia wrote the initial grant to create the Invasive Plant Atlas of New England. She collaborates in efforts to control pale swallowwort on Mt. Tom and current efforts focus on eliminating Japanese stiltgrass, which has been making inroads in Franklin County. Her work includes public education as well as hands-on removal efforts.